Thrombotic disease, a major life–threatening complication of nephrotic syndrome, has been associated with proteinuria and hypoalbuminemia severity. However, it is not fully understood how disease severity correlates with severity of the acquired hypercoagulopathy of nephrotic syndrome. Without this knowledge, the utility of proteinuria and/or hypoalbuminemia as biomarkers of thrombotic risk remains limited. Here, we show that two well established ex vivo hypercoagulopathy assays, thrombin generation and rotational thromboelastometry, are highly correlated with proteinuria and hypoalbuminemia in the puromycin aminonucleoside and adriamycin rat models of nephrotic syndrome. Notably, in the puromycin aminonucleoside model, hyperfibrinogenemia and antithrombin deficiency were also correlated with proteinuria severity, consistent with reports in human nephrotic syndrome. 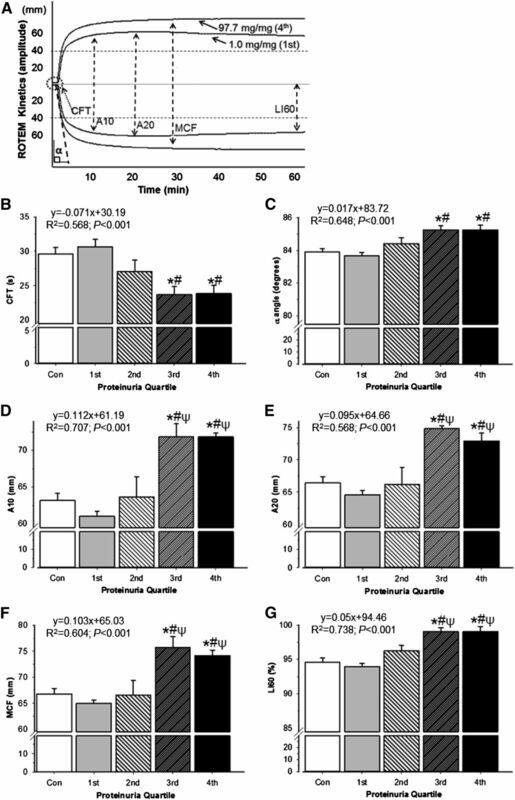 Importantly, although coagulation was not spontaneously activated in vivo with increasing proteinuria, vascular injury induced a more robust thrombotic response in nephrotic animals. In conclusion, hypercoagulopathy is highly correlated with nephrotic disease severity, but overt thrombosis may require an initiating insult, such as vascular injury. Our results suggest that proteinuria and/or hypoalbuminemia could be developed as clinically meaningful surrogate biomarkers of hypercoagulopathy to identify patients with nephrotic syndrome at highest risk for thrombotic disease and potentially target them for anticoagulant pharmacoprophylaxis. Nephrotic syndrome (NS), one of the most common forms of glomerular disease, is characterized by massive proteinuria, hypoalbuminemia, edema, and hyperlipidemia.1,2 As recently reviewed, it is well known that nephrotic-range proteinuria is associated with an acquired complex hypercoagulopathy.3–6 The hypercoagulable state is associated with acquired deficiencies of key hemostatic regulatory elements, such as antithrombin (AT) and free Protein S, and elevated levels of high molecular weight procoagulant factors (including factors V and VIII, vWf, and fibrinogen). The predicted overall effect of these coagulation derangements is an enhanced capacity for thrombin generation (conversion of prothrombin to thrombin), which is the key effector enzyme of the hemostatic system.3–5 However, the effects of these derangements on the dynamics of coagulation system activation are not well understood. Thromboembolic disease is a major life–threatening complication of NS, occurring in an estimated 26.7% of adults and 2.9% of children with NS.3,7 In fact, compared with other kidney diseases, NS carries the highest risk of thrombosis, many episodes of which may be preventable.8,9 The acquired blood coagulation derangements are believed to be a major contributor to NS–associated thrombotic risk. Although thrombosis could potentially be prevented with prophylactic anticoagulation, this approach remains controversial because of the treatment-associated risk of bleeding complications.10–12 Recent epidemiologic studies have revealed that both proteinuria and serum albumin may be associated with the likelihood of thrombosis, with higher proteinuria and lower serum albumin correlating with increased thrombotic risk, suggesting that disease severity may be directly correlated with the severity of coagulation system derangement.13–18 Thus, determining the relationship between hypercoagulopathy and these markers of disease severity may lead to the identification of clinically meaningful urine protein and/or serum albumin levels beyond which prophylaxis with anticoagulants may be warranted. Importantly, derangements of individual coagulation system components similar to those found in human NS have been previously shown in both the puromycin aminonucleoside (PAN) and adriamycin (ADR) –induced rat nephrosis models.19–21 However, these investigations have not previously addressed the critically important collective effects of these subcomponent variations on overall hemostatic potential and their effects on in vivo thrombus formation. The aim of this study was, thus, to determine the relationship between NS severity and the dynamics of coagulation system activation. We hypothesized that both ex vivo and in vivo coagulation activation would be enhanced in the setting of nephrosis. We first established that proteinuria is dose dependent in the PAN–induced rat nephrosis model. As expected, at 9 days post-PAN injection, rats displayed a dose-dependent escalation of proteinuria (Figure 1A).21–23 We then assessed thrombin generation in the platelet-poor plasma (PPP) collected from these rats using a thrombin generation assay (TGA). TGA is a well established method used to assess the overall capacity of the coagulation cascade to convert prothrombin to thrombin.24–29 Two TGA parameters, peak thrombin and the area under the TGA curve (also known as endogenous thrombin potential [ETP]), are known to correlate with the likelihood of thrombotic disease. TGA displayed an escalating dose–dependent effect in PAN-treated rats (Figure 1B). Proteinuria severity directly correlated with these TGA parameters, such that a significant positive linear correlation was found between proteinuria level and both peak thrombin (R2=0.29; P<0.002) (Figure 1C) and ETP (R2=0.87; P<0.001) (Figure 1D, Table 1). Therefore, to more readily illustrate the effects of proteinuria on coagulation parameters, the proteinuria distribution from rats receiving 25–150 mg/kg PAN was divided into quartiles (first interquartile range [IQR] =1.37–4.20; second IQR =6.65–44.17; third IQR =56.70–98.32; fourth IQR =99.54–116.60 mg/mg protein-to-creatinine), and saline-injected rats were labeled as controls for the remaining analyses. Thus, peak thrombin (Figure 1E) and ETP (Figure 1F) were significantly greater in the third and fourth quartiles of proteinuria severity compared with both those in the first quartile of proteinuria (P<0.05) and control rats (P<0.05). Hence, these data indicate that maximal enzymatic activity of thrombin (peak thrombin) is weakly but significantly correlated with proteinuria, whereas ETP, which indicates total thrombin exposure over time, is more strongly correlated. 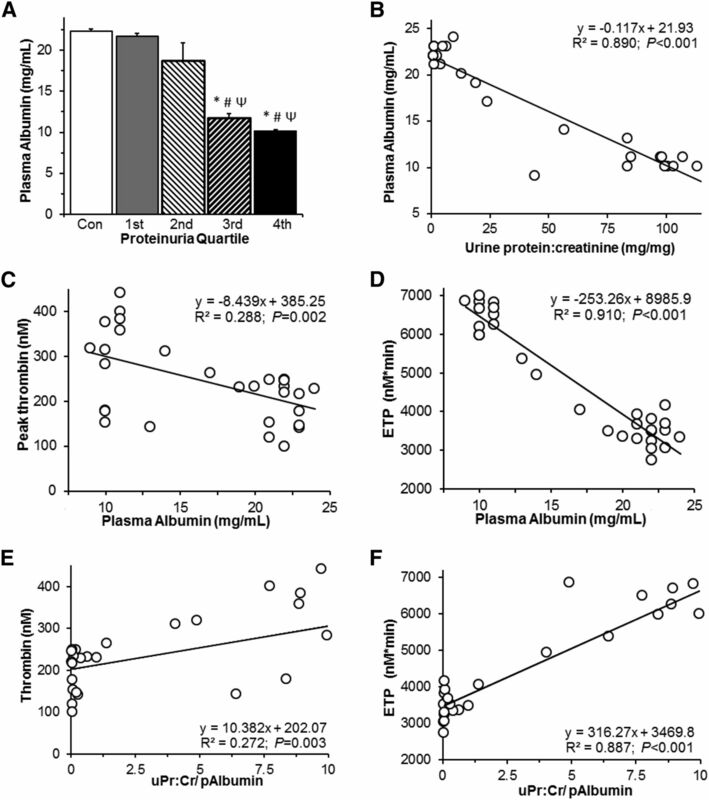 Proteinuria severity in the PAN–induced rat nephrosis model is dose dependent and directly proportional to thrombin generation. (A) Mean±SEM urine protein-to-creatinine and plasma albumin concentration in rats given varying doses of PAN. (B) Representative TGA curves from one rat in each PAN dose group. (C and D) There was a significant positive correlation between urine protein-to-creatinine and parameters of TGA, such that rats in the highest proteinuria quartiles (third and fourth) exhibited increased (E) peak thrombin and (F) ETP versus the control (Con) and first quartile groups. n=6 rats per group. uPr:Cr, urine protein-to-creatinine. *P<0.05 versus Con or 0 mg/kg PAN groups; #P<0.05 versus first proteinuria quartile or 25 mg/kg PAN groups. To further assess the dynamics of nephrotic coagulation responses in the presence of all blood components, whole–blood rotational thromboelastometry (ROTEM) was assessed.30 This assay is used to assess the viscoelastic properties of blood clot formation over time in whole blood, thus including the effects of cellular blood components on coagulation. Similarly to TGA, ROTEM has been shown to correlate with hypercoagulability and thrombotic risk.31–36 Correspondingly, PAN-nephrotic rats also exhibited differential proteinuria–dependent hypercoagulopathy derangements in ROTEM parameters (Figure 2A). Clot formation time (CFT) (Figure 2B) was significantly decreased, whereas α-angle (Figure 2C), amplitude at 10 (A10) (Figure 2D) and 20 min (A20) (Figure 2E), maximum clot firmness (MCF) (Figure 2F), and residual clot firmness after urokinase-induced fibrinolysis at 60 min (lysis index at 60 min; LI60) (Figure 2G) were all significantly increased in the rats exhibiting the highest levels of proteinuria (third and fourth quartiles; P<0.05 for each parameter). Furthermore, significant linear correlations were found between proteinuria and all measured ROTEM parameters (Figure 2, B–G, regression formulas, Table 1). Specifically, the extent of proteinuria was significantly negatively correlated with CFT (R2=0.57; P<0.001) and positively correlated with the remaining parameters (α-angle, A10, A20, MCF, and LI60 at R2=0.65, R2=0.71, R2=0.57, R2=0.60, and R2=0.74, respectively; P<0.001 for each parameter), indicating that the onset of clot formation occurs earlier (CFT), proceeds more rapidly (α-angle), results in higher viscoelastic strength (A10, A20, and MCF), and is more resistant to fibrinolysis (LI60) in a manner that is directly proportional to proteinuria severity. PAN-nephrotic rats exhibit differential derangements in ROTEM parameters that correlate with proteinuria severity. (A) Example ROTEM tracing describing the measured ROTEM variables, with representative ROTEM tracings from one control (1.0 mg/mg urine protein-to-creatinine) rat and one PAN-nephrotic (97.7 mg/mg urine protein-to-creatinine fourth proteinuria quartile) rat. (B–G) Mean±SEM of measured ROTEM parameters. The highest dose groups exhibited differential derangements in ROTEM parameters, such that (B) CFT was decreased and (C) α-angle was increased in rats in the third and fourth proteinuria quartiles versus the control (Con) and first and second quartile groups. Linear regression analysis of urine protein-to-creatinine and all measured ROTEM parameters showed that proteinuria was negatively correlated with CFT and positively correlated with α-angle, (D and E) A10, A20, (F) MCF, and (G) LI60. n=6 rats per group. *P<0.05 versus Con; #P<0.05 versus first proteinuria quartile; ΨP<0.05 versus second proteinuria quartile. As expected, plasma albumin decreased with increasing PAN doses (Figure 1A), and thus, plasma albumin both decreased successively with each quartile of increasing proteinuria severity (Figure 3A) and exhibited a significant negative correlation with proteinuria (R2=0.89; P<0.001) (Figure 3B). Indeed, given this highly correlative relationship between increased proteinuria and hypoalbuminemia established here and elsewhere,37,38 it is not surprising that our results show a significant negative correlation between plasma albumin and both peak thrombin (R2=0.29; P<0.002) (Figure 3C) and ETP (R2=0.91; P<0.001) (Figure 3D, Table 1). Interestingly, combining the individual proteinuria and hypoalbuminemia data to form a ratio of the two, as recently reported in a clinical epidemiology study,18 also resulted in significant correlations with peak thrombin (R2=0.27; P<0.003) (Figure 3E) and ETP (R2=0.89; P<0.001) (Figure 3F). However, this method did not meaningfully improve the correlation coefficients compared with those obtained using either proteinuria or hypoalbuminemia in isolation. Congruently, significant linear correlations (of similar but inverse magnitudes to those between proteinuria and ROTEM parameters described above) were found between plasma albumin and all measured ROTEM parameters (Table 1). Hypercoagulability is inversely proportional to plasma albumin in the PAN–induced rat nephrosis model. 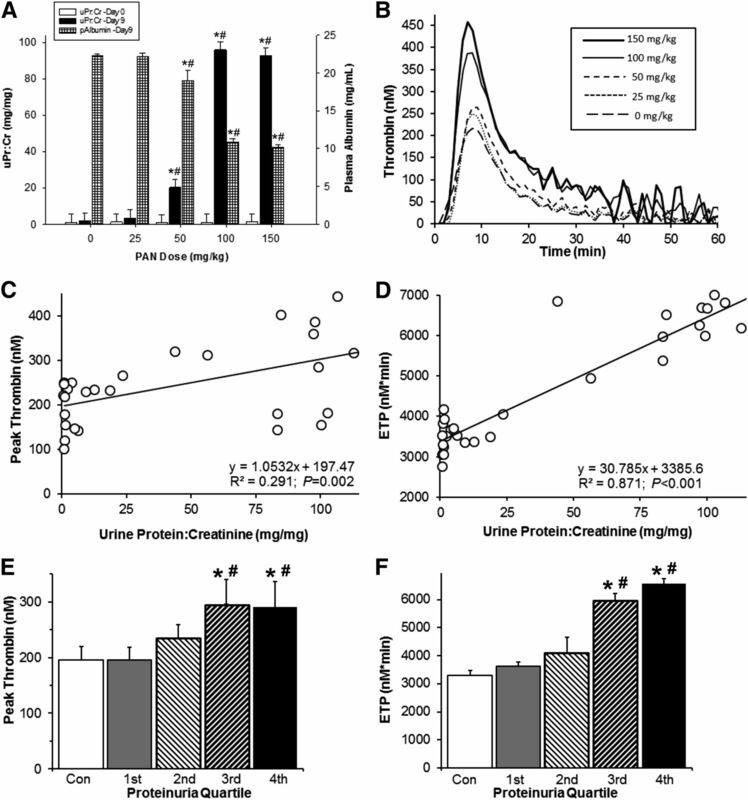 (A) Mean±SEM plasma albumin concentration in PAN–induced nephrotic rats exhibiting varying levels of proteinuria (control group and first through fourth proteinuria quartiles). (B–D) There was a significant negative correlation between plasma albumin concentration, protein-to-creatinine ratio, peak thrombin, and ETP. (E and F) The ratio of proteinuria to plasma albumin was positively correlated with peak thrombin and ETP. n=6 rats per group. uPr:Cr, urine protein-to-creatinine. *P<0.05 versus control (Con); #P<0.05 versus first quartile; ΨP<0.05 versus second quartile. Because fibrinogen is known to be elevated and AT is known to be deficient in human subjects with NS, to further characterize the hypercoagulopathy of the PAN model, we also measured plasma fibrinogen and AT.3–5 Interestingly, plasma AT concentration was not significantly altered by proteinuria (Figure 4A). This finding suggested that the well known AT deficiency may be caused by a qualitative defect in enzymatic activity, which was significantly correlated with proteinuria (Figure 4B) (R2=0.32; P=0.001). As expected, fibrinogen concentrations also increased slightly but significantly with worsening proteinuria (Figure 4C) (R2=0.47; P<0.001). Moreover, both fibrinogen and AT activity were significantly correlated with plasma albumin (R2=0.52; P<0.001 and R2=0.32; P=0.001, respectively; data not shown). Because a major function of AT is to downregulate thrombin activity, this deficiency may explain, at least in part, the stronger correlation between ETP and proteinuria/hypoalbuminemia, despite a weaker correlation with peak thrombin activity (Figure 1, C and D). Hyperfibrinogenemia and qualitative AT deficiency are proteinuria dependent in PAN–induced rat nephrosis. Mean±SEM plasma concentrations of (A) AT, (B) AT activity, and (C) fibrinogen in PAN–induced nephrotic rats exhibiting varying levels of proteinuria, with linear regression correlation formulas between proteinuria and the measured variable. n=6 rats per group. *P<0.05 versus control (Con); #P<0.05 versus first quartile. 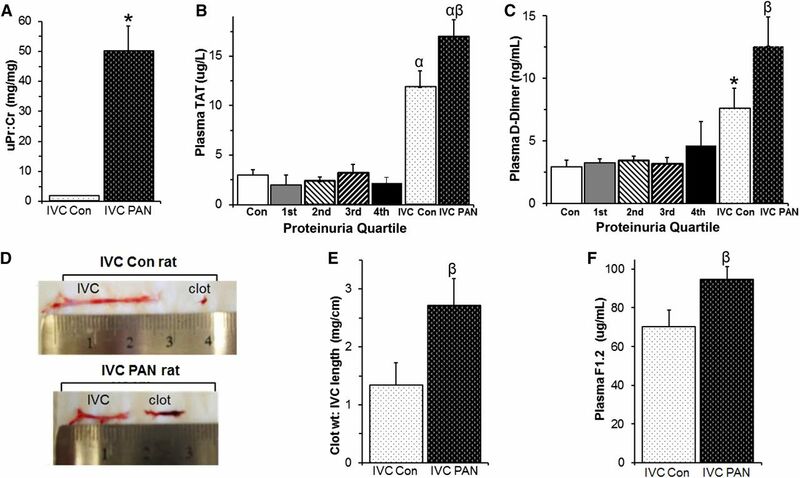 To evaluate the in vivo prothrombotic significance of the relationship between proteinuria and TGA, inferior vena cava (IVC) ligation studies were performed in PAN–induced nephrotic rats exhibiting moderate levels of proteinuria and saline–injected control rats (Figure 5A). Thrombin-antithrombin complex (TAT) and d-dimer are markers of in vivo thrombin regulation and fibrinolysis, respectively. Importantly, plasma TAT and d-dimer levels did not change with worsening proteinuria in rats not subjected to IVC ligation (Figure 5, B and C), suggesting that massive proteinuria alone is not sufficient to activate in vivo coagulation. In contrast, when an active thrombotic episode was induced by IVC ligation, proteinuric rats exhibited significantly greater thrombus burden (P<0.05) (Figure 5, D and E), which was accompanied by higher plasma TAT (P<0.05) (Figure 5B) and d-dimer (P<0.05) (Figure 5C) concentrations than in saline–injected control rats. Similarly, prothrombin fragment 1.2 (F1.2), a byproduct of the conversion of prothrombin to thrombin, was significantly higher in plasma from ligated nephrotic rats (Figure 5F) (P<0.05). These data, thus, indicate a more robust coagulation response to vascular injury in proteinuric animals. In vivo coagulation is not activated de novo in the setting of massive proteinuria but is more robust when stimulated during PAN nephrosis. IVC ligation was performed in two groups of rats treated with either 100 mg/kg PAN (IVC PAN) or vehicle (IVC Con). (A) Despite massively increased urine protein-to-creatinine (uPr:Cr) at day 9 and elevated ex vivo thrombin generation, there was no difference in the plasma concentration of (B) TAT or (C) d-dimer in any of the nonligated rat groups (first through fourth proteinuria quartiles) versus control (Con). In contrast, plasma TAT and d-dimer contents were substantially increased in rats experiencing an active thrombotic episode induced by IVC ligation, with (B and C) a further significant increase seen in highly proteinuric IVC PAN rats compared with IVC Con rats, which ultimately (D and E) translated into greater thrombus formation. (D) Representative photos of clot size in one PAN–treated nephrotic rat (IVC PAN) and one sham-treated rat (IVC Con) harvested 1 hour after in vivo IVC ligation was performed. (E) Mean±SEM for the ratios of clot weight (milligrams) to IVC length (centimeters). (F) As additional evidence that the severity of the active thrombotic episode was greater in PAN–treated proteinuric rats, plasma F1.2 concentrations were also higher in IVC PAN rats versus IVC Con rats. Data are means±SEMs for n=6 per group. *P<0.05 versus Con; αP<0.05 versus all non-IVC–ligated groups; βP<0.05 versus IVC Con group. Previous studies of hepatic protein synthesis in the presence of PAN suggest that these findings are not PAN specific.37,39 However, to directly evaluate this possibility, we also compared TGA and ROTEM with both proteinuria and hypoalbuminemia in the ADR–induced rat nephrosis model. ADR-injected rats exhibited a range of moderate to high proteinuria levels at 21 days postinjection (Figure 6A). As expected, results from the ADR model were entirely complimentary to and thus, corroborative of our findings in the PAN model. TGA parameters displayed an escalating proteinuria–dependent effect (Figure 6B) with significant increases in peak thrombin and ETP in ADR–induced proteinuric rats compared with saline-injected controls (Table 2). Concomitantly, ADR rats also exhibited derangements in whole–blood ROTEM parameters (Figure 6C) comparable with those in the PAN rats, which were also significantly correlated with proteinuria (Table 2). As in the PAN model, these results were highly correlated with plasma albumin in an inverse pattern to that seen with proteinuria (Table 2). AT activity was significantly lower in the ADR-injected rats (65.07±4.28%) than in control animals (85.83±4.22%; P<0.05) and significantly correlated with proteinuria (R2=0.46; P=0.02; data not shown). Proteinuria and plasma albumin are highly correlated with hypercoagulability in the ADR model of nephrosis. (A) Mean±SEM urine protein-to-creatinine in control rats (Con) and rats with ADR-induced nephrosis. (B) TGA parameters exhibited a dose-dependent effect, such that peak thrombin concentration and ETP were higher in rats exhibiting higher (milligrams per milligram) proteinuria levels. (C) ADR rats with higher proteinuria levels also exhibited the greatest differential derangements in ROTEM parameters as illustrated by representative ROTEM tracings from one Con (2.3 mg/mg urine protein-to-creatinine) rat and one ADR-nephrotic (50.0 mg/mg urine protein-to-creatinine) rat. *P<0.05 versus Con. uPr:Cr, urine protein-to-creatinine. On the basis of the elevated risk of thrombosis and the acquired coagulation derangements known to occur in NS, increased TGA has long been suspected to exist during nephrotic-range proteinuria.3–7 In this study, we have shown that TGA is highly correlated with proteinuria severity and hypoalbuminemia in two commonly used animal models of NS. Furthermore, these studies show that these animals are also hypercoagulable in a proteinuria- and hypoalbuminemia-dependent fashion, with no apparent threshold effect. These findings strongly suggest that the enhanced thrombin–generating capacity of nephrotic hypercoagulopathy is responsible for the thrombotic predisposition and that the risk of thrombosis progressively increases proportionately to disease severity. The coagulation derangements identified in PAN-nephrotic rats are consistent with previous reports and phenotypically similar to that reported in human NS with respect to hyperfibrinogenemia and AT deficiency.3–6,19,20 Thus, the PAN nephrosis model is an excellent preclinical model for the investigation of the acquired hypercoagulopathy of human NS. Both of these animal models are induced with toxins that may have systemic effects. PAN is used as a control condition for protein biosynthesis studies, where it is typically compared with puromycin and other potent ribosomal inhibitors.39,40 Previous studies have shown that PAN disturbs cytoskeletal and extracellular matrix protein organization but does not affect protein synthesis in cultured glomerular epithelial cells.41 Hepatic protein synthesis is known to be upregulated in PAN-nephrotic rats, presumably in a compensatory fashion to the proteinuria, but coagulation zymogen synthesis has not been directly studied.37 ADR is a widely used DNA intercalating chemotherapeutic agent with well described side effects.42 It is not known to induce a coagulopathy, but myelosuppression with associated thrombocytopenia is a dose-limiting toxicity. In rats, ADR–induced thrombocytopenia nadirs at about 1 week and at 3 weeks (the time point used in this study) thrombocytosis is seen.20 Although thrombocytosis may be manifested by increased maximal clot firmness in ROTEM assays, it is not expected to significantly alter thrombin generation in PPP.43 Thus, it is unlikely that the findings in this study are secondary to off–target coagulation effects of these agents, which have differing mechanisms of action, suggesting that the hypercoagulopathy is secondary to nephrosis. Although the global hemostasis assays used in this study are advantageous for identifying the summative hemostatic effect of a complex coagulopathy, such as NS, they do not directly assess derangements in the subcomponents of the hemostatic system that have been described in human NS.3–6 Nonetheless, some broad conclusions can be ascertained. For instance, the increase in thrombin generation, likely because of a combination of natural anticoagulant deficiencies and elevations in the high molecular weight procoagulant cofactors V and VIII, is shown by both the increases in TGA parameters as well as the shorter CFT and steeper α-angle in the ROTEM.34 The increased ROTEM MCF may be reflective of hyperfibrinogenemia providing additional thrombin substrate, and the greater LI60 suggests the presence of a hypofibrinolytic state caused by accumulation of α2-macroglobulin and other derangements in the fibrinolytic system.3,4 Thus, the phenotypic changes identified in these assays are consistent with those expected in human NS. Reinforcing this conclusion, we identified increasing levels of fibrinogen and decreasing levels of AT activity in association with increasing proteinuria severity, which is consistent with the coagulation defects described in human NS.3–5 Interestingly, the latter data in the presence of normal quantitative levels of AT suggest that PAN nephrosis is associated with an acquired qualitative deficiency of AT. The molecular etiology of this phenomenon is unclear from these data; however, it is well known that AT activity is dependent on the cofactor activity of heparin.49 Interestingly, albumin may have a heparin-like activity, although the molecular basis of this property is not well understood.50 Thus, the fact that hypoalbuminemia may impart qualitative AT deficiency by a loss of this heparin-like activity is an attractive hypothesis worthy of additional investigation. PAN-induced proteinuria was maximal with doses ≥100 mg/kg in these experiments. Doses of 150 mg/kg were recommended in a recent review and have been widely published in the NS field, including protein-to-creatinine values similar to those in this study.21,51 Nonetheless, attaining the extreme of proteinuria may have unmasked potentially important pathophysiologic coagulation changes that would not otherwise be detectable. The stable levels of TAT and d-dimer, despite increasing proteinuria severity, suggest that the hemostatic system remains quiescent in vivo in the absence of an insult that activates the hemostatic mechanism. After initiated, however, the nephrotic animals displayed significantly greater levels of in vivo markers of thrombin generation (F1.2), regulation (TAT), and intravascular coagulation (d-dimer). This finding may be consistent with a two-hit hypothesis of thrombus development, which has been proposed for other prothrombotic disorders (e.g., antiphospholipid syndrome), in which the presence of an acquired prothrombotic coagulopathy (first hit) is not sufficient to induce thrombosis in the absence of a second event, such as vascular injury (second hit).52 This hypothesis may also be relevant in human NS, in which some but not all patients develop thrombosis. Thus, future studies should investigate the compound effects of both disease severity (first hit) and other prothrombotic circumstances (second hit), such as trauma, obesity, cardiovascular disease, venous catheter–related endothelial injury, or venous stasis related to edema, poor perfusion, or bed rest. For example, thromboembolism may occur as the presenting manifestation of NS, but whether these patients have an underlying thrombotic predisposition remains unexplored.8,17 Alternatively, hypercoagulopathy may fluctuate from the acute to chronic phase of disease. For example, albumin and coagulation factors are regulated by both similar and independent transcription factor pathways, and synthetic compensation for coagulation derangements may, thus, be in disequilibrium to albumin compensation.53,54 These experiments do not address the apparent predilection for renal vein thrombosis in human NS.3 However, it is reasonable to postulate that renal vein blood may be maximally hypercoagulable. Increased TGA has been shown in a single human study of NS.28 However, there was no identifiable correlation with proteinuria severity in this small study of convenience samples. Conversely, these animal data strongly suggest that massive proteinuria is the major independent variable and driving force behind the complex acquired hypercoagulopathy of nephrosis. Interestingly, thrombin has been identified in the urine of both PAN-nephrotic rats and children with NS,19,55 shown to modulate podocyte injury in vitro,56 and inhibition of thrombin has been shown to ameliorate proteinuria in PAN-nephrotic rats.57 Thus, the effects of proteinuria and hypoalbuminemia on thrombin generation deserve additional study both in the context of glomerular biology and in prospective clinical cohorts to determine their use to predict hypercoagulopathy. Despite the fact that TGA is a known marker for thrombotic risk, clinical application has been limited because of poor interlaboratory standardization of assay techniques.58–60 However, both serum albumin and proteinuria severity have been epidemiologically linked to thrombotic risk.13–18 Thus, if confirmed, proteinuria and/or serum albumin may become suitable, readily available, surrogate biomarkers useful for identifying those patients most at risk for thrombosis and thus, most likely to benefit from thromboprophylactic measures. In experiments to confirm that the coagulation results were not PAN dependent, and we repeated selected experiments with the extensively used ADR model of nephrosis.21 For these experiments, two groups (n=6 per group) of male Wistar rats (body weight=approximately 150 g; age=approximately 45–50 d) were administered 7.5 mg/kg ADR diluted in 500 μL sterile saline or sterile saline alone (sham) by tail vein injection. Morning spot urines were collected from each rat on days 0, 7, 14, and 21. After the collection of the final in vivo measurements on day 21, the rats were anesthetized by isoflurane inhalation, and blood was collected as described above. ROTEM was performed on whole blood within 20 min of collection using the INTEM (activated intrinsic pathway) assay with and without urokinase (35 ng) using a ROTEM delta Instrument (Tem Innovations GmbH, Munich, Germany). PPP was prepared as previously described59 from the remaining blood sample, flash frozen in liquid nitrogen, and stored at −80°C until additional analysis. TGA assays were performed on PPP diluted 1:1 with buffer using the Technothrombin TGA Kit (Technoclone, Vienna, Austria) and TGA RC Low Reagent and read on a Spectramax M5 Fluorescent Plate Reader (Molecular Devices, Sunnyvale, CA). TGA experiments were also confirmed using TGA RB Reagent (data not shown). Relative fluorescence units (RFUs) were converted to thrombin (nanomolar) generation curves using Technoclone Evaluation Software, which also calculates characteristic parameters, including peak thrombin concentration and ETP. Urine protein-to-creatinine and plasma albumin concentrations were measured by Antech GLP (Morrisville, NC) using standard techniques that are fully compliant with the Good Laboratory Practice regulations as well as other regulatory requirements. Plasma concentrations of TAT (Enzygnost; Siemens, Tarrytown, NY) AT, fibrinogen, F1.2, and d-dimer (MyBioSource, San Diego, CA) were measured by ELISA assay kits validated for use in the rat. Rat AT activity was estimated by the amidolytic method modified to use the fluorogenic thrombin substrate Z-Gly-Gly-Arg-AMC (Technoclone).61 In brief, after the addition of excess heparin and thrombin, fluorescence of the cleaved substrate was measured (360/460 nm) kinetically, and AT activity was taken as the initial rate of change (ΔRFU per minute) over 10 min. A standard curve was prepared using AT–depleted normal human plasma (Sekisui Diagnostics, Lexington, MA) mixed with pooled normal rat plasma (0%–100%), and the percentage of normal rat AT activity was determined by plotting the ΔRFU value for each test sample on the standard curve. For this experiment, we used the IVC stasis model of venous thrombosis in two groups of male Wistar rats treated with either 0 or 100 mg/kg intravenous PAN as described above (n=6 per group).45,46 After urine collection on day 9, the rats were deeply anesthetized by isoflurane inhalation (3%–5%), and IVC ligation was performed. After a midline laparotomy to expose the IVC at the level of the renal veins by careful blunt dissection, a 6–0 prolene suture was looped around the IVC immediately caudal to the origin of the renal veins and ligated to completely occlude blood flow. After 60 minutes of ligation, whole blood was collected from the IVC cephalad to the ligature by venipuncture using a 23-gauge needle into a final concentration of 0.32% NaCitrate/1.45 µM Corn Trypsin Inhibitor. The distal section of IVC from the ligature caudad was then carefully removed. Any thrombus present was harvested from the IVC by careful dissection, gently washed in phosphate-buffered saline, blotted dry, weighed, and photographed. Statistical significance was determined by the unpaired t test for single comparisons and one- or two-way ANOVA for multiple group comparisons using Sigmastat software (Systat, San Jose, CA). Sigmastat software was also used to determine the interquartile proteinuria ranges for the PAN-injected rats. When a significant difference was identified by ANOVA, post hoc tests were performed using the Student–Newman–Keuls technique. Statistical significance was defined as P<0.05. Data are presented as means±SEMs. We thank Drs. Matthias Kretzler, Berend Isermann, Charles J. Lockwood, and Alisa Wolberg for helpful discussions. B.A.K. was supported by Grant U54-DK083912-05S1 from the National Institutes of Health National Institute of Diabetes and Digestive and Kidney Diseases.